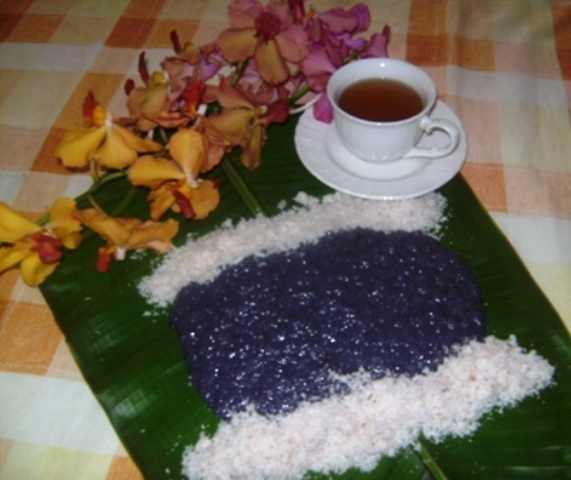 Rice is the most important staple food for a large part of the world’s human population, especially in the Philippines. Aside from cooked plain rice, it may also be used to prepare dishes for snacks and desserts which your family can enjoy to eat. With these rice recipes, you can start your own rice recipes business (kakanin business) that will augment your daily income. 1. Cook glutinous rice with water at 1:1 rice to water ratio. 2. Extract milk from coconut. 3. Mix coconut milk, cooked glutinous rice and sugar in a wok thoroughly. 4. Cook mixture under moderate fire until done. 5. Add food coloring and mix well. 6. Let it cool for a while and serve. 1. Soak rice in water for about 30 minutes. Drain well. 2. Heat oil and saute rice and food seasoning for about three minutes. 3. Add in rest of the ingredients. Mix well. 4. Cook rice over low fire for about one hour and fifteen minutes or until done. Stir every ten minutes. Combine rice, cheese and seasonings in saucepan. Cook until cheese melts, stirring frequently. Top each serving with 2 tbsp sour cream and 1 tbsp bacon bits. 1. Soak glutinous and ordinary rice for about four hours. Wash and grind. 2. Combine ground rice with sugar and food coloring then place in a mold. 4. Combine grated coconut, milk and sugar and cook over low heat. Mix it occasionally until golden brown. 5. Put in a molder and let it cool. 6. For the toppings, toast peanuts and pulverize it. Mix it with some grated coconut and cook it over low fire until done. Put the toppings at the steamed rice. Slice and serve. 1. Saute ground meat with garlic and onion. 4. Wrap the cooked rice in a lumpia wrapper. 1. Soak raw and cooked rice in water until soft. Grind together. 2. Put the ground rice in a container. 3. Add sugar and baking powder then mix thoroughly. Set aside. 4. In preparing the toppings, saute the ground meat with garlic and onion until meat is cooked. 5. Pour water and allow the sauted meat to boil. 6. Add the potatoes and carrots until done. 9. Put some cooked meat on top of molds. 10. Steam over boiling water. 11. When done, set molds in cold water. 12. Remove puto from the mold and serve. 1. Heat oil in large pan over medium heat. Add sausage and cook in three minutes. Add onions and continue cooking in 3 minutes. 2. Add bell peppers, garlic, all seasonings and tomatoes. Cook in 4 minutes over high heat. 3. Stir in rice and pour in some water with chicken broth cubes. Mix well, cover and cook in 16 minutes over low heat. 4. Add crab meat and shrimp to rice. Cover and continue cooking in 4 minutes. Remove bay leaf. 1. Put the newly cooked rice in a mixing bowl. Mix it with rice wine and sugar. Put sesame seeds and set aside to fully absorb the wine in the rice. 2. Prepare the sushi mat. Place the nori sheet and evenly spread a cup of rice on top of nori sheet. Spread the rice with some mayonaise. 3. Layer the mango, cucumber and crab sticks on top of the rice. Through the help of sushi mat, roll the nori to make sushi rolls. 4. Gently cut the sushi into some slices and serve. 1. Boil 3 cups of rice with 3 cups of water and 3 cups of the cream. Add the cinnamon and calamansi leaves. 2. When it is almost soft, add the rest o the cream with raisins, then the evaporated milk, then the eggnog, sugar (to taste) and lastly the condensed milk and powdered milk to taste. 1. Beat the eggs and fry. Cut into small pieces and set aside. 2. Put the cooked and cold rice in a container and break up the lumps. Put some drops of soy sauce and mix well. 3. Saute garlic and onion. Add the cooked chorizo bilbao, shrimps, carrots and green peas. 5. Add salt to taste. When the rice is almost done, put the eggs and the green onion leaves. Mix well and serve hot. Do you like this money making business idea? then please consider subscribing to our RSS feed. content“>You can also subscribe by email and have new articles sent directly to your inbox. (Once you entered your e-mail address, you need to login to your e-mail account and click the link to confirm your subscription).